AMSED wants to motivate young people to show solidarity ! 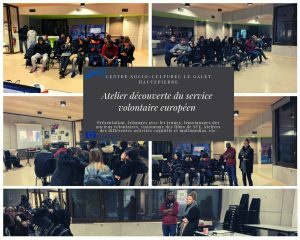 On January 25, 2019, the young ambassadors of the AMSED went to the Hautepierre CSC, in order to meet young people and lead a workshop to discover more about the European Voluntary Service, but also about the International Solidarity Projects organized by AMSED. A presentation was made, but especially exchanges with young people (questions / answers), and testimonials of two former volunteers, Mathilde and Sigfried. We had the opportunity to show them different films of SVE 2017 & 2018, but also a film from the shipyard in Nepal in 2018. Different young people wanted to go on a mobility trip with us, and were very motivated to smile for a moment to the children and families of the different countries that we propose.